Grevillea leiophylla is closely related to the better known G. linearifolia. The difference seems to lie in the clothing of the leaves. The leaves of Grevillea leiophylla are naked and green on both sides whilst those of G. linearifolia are clothed in silky hairs on the underside. 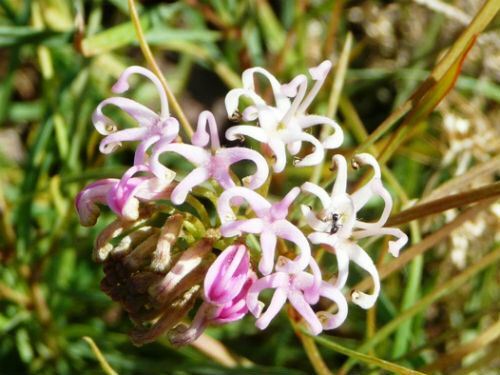 Grevillea leiophylla is a small shrub with linear-lanceolate leaves up to 30 millimetres long. Pink flowers are held in terminal, spidery clusters and appear in spring and summer. Grevillea leiophylla could be grown as a foreground plant in native garden beds or in cottage gardens and rockeries. Tip pruning would be appreciated. This small species is a native of Queensland and is found north of Brisbane. The species name means smooth leaf. The type specimen was collected from the Glasshouse Mountains in the mid 1870’s.